In keeping with our philosophy of component based agile reusable architecture, we have experience in a variety of JS frameworks that help us to deliver the true enterprise applications. The separation of view from the middleware and database has been at the crux of our development. This has allowed us to successfully adapt to changing business needs and be really agile in our development. AngularJS has been one of the UI/UX frameworks we have deployed from prototyping. This has helped our customers to get a feel early in the development process while the requirements are still fluid, thereby enabling them to play around with the developing application. However keeping with our mantra of not tying ourselves with a particular framework, we have the experience and exposure to alternative JS frameworks like ReactJS and VueJS. 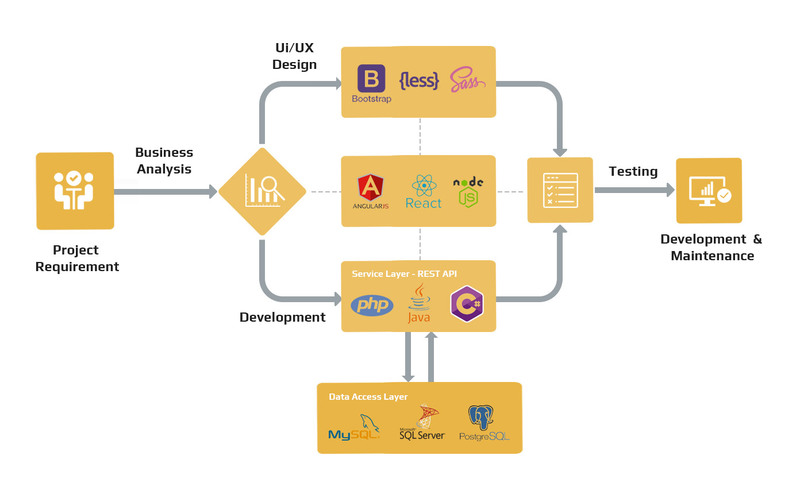 The choice is dependent on the size of the application being built and the complexity and we keep our customers informed on the choice of framework and the reasons while doing so. To know more about our front-end web / mobile application development, please contact us .